"Let me see your identifications." 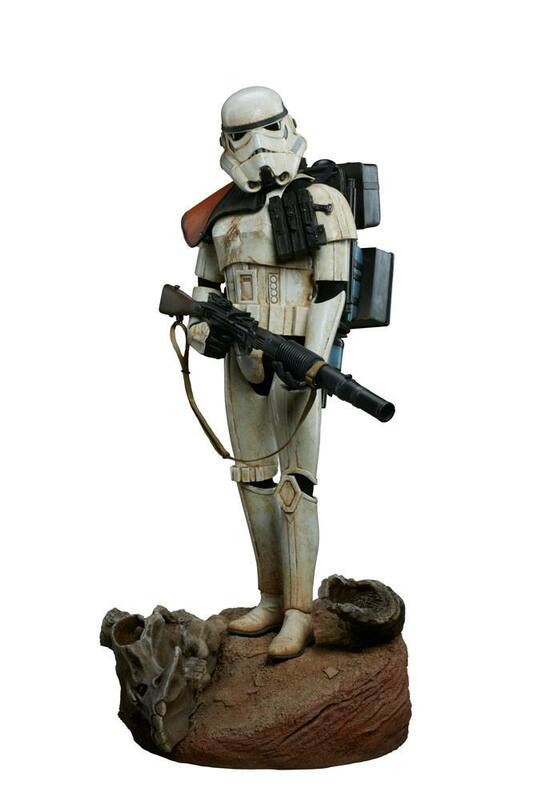 Sideshow proudly presents the Sandtrooper Premium Format™ Figure inspired by appearances in Star Wars: A New Hope. Deployed on a mission to the desert world of Tatooine with his standard issue blaster in hand. the Imperial Sandtrooper is armed and ready for anything – except perhaps Jedi mind tricks. On the lookout for Rebel forces and missing droids. the battle-hardened squad leader is fully equipped to operate in the harshest environments. fitted with authentically detailed weathered armor and survival gear. Depicted patrolling a barren stretch of the Dune Sea. the figure stands atop a themed deco base featuring an enormous bantha skull at his feet. Joining the growing ranks of Sideshow’s Star Wars Premium Format Figure collection. the Sandtrooper Premium Format™ Figure will be an incredible recruit for any Imperial army.